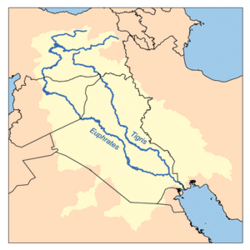 Map of the Tigris-Euphrates Watershed. The Euphrates (Hebrew: פרת, Perāth; Syriac: ܦܪܬ, Prāth; Greek: Ευφράτης, Euphratēs; Arabic: الفرات, Al-Furāt) is the western river of the two rivers that make up Mesopotamia, along with the Tigris, which flows from the mountains of Anatolia, Turkey through Iraq. This page was last modified on 20 March 2013, at 19:44.